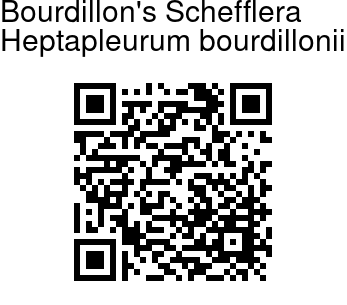 Bourdillon's Schefflera is a tree, up to 8 m tall, with leaves digitately compound, alternate, spiral. It is named in honor of Thomas Bourdillon Fulton Stipules (1849-1930), who collected plants in India. Stipules are intrapetiolar, fused within the leaf-stalk; axis 4-10 cm long, slender, sheathing at the base, hairless; leaflets 5-8; leaflet-stalk 0.5-1.5 cm, slender, articulate; blade 4-9 x 0.6-2 cm, obovate, spoon-shaped, elliptic-obovate or rhomboid, base narrowed or wedge-shaped, tip blunt, notched, margin entire, reflexed, hairless, leathery; lateral nerves 2-7 pairs, pinnate, prominent, intercostae netveined. Flowers are bisexual often polygamous, 5 mm across, in branch-end hairy umbel-like racemes up to 4 cm long. Flower-stalks are 5-10 mm long; calyx flat, without sepals. Petals are 5, ovate, tapering, inflexed; staminodes in females 5, subulate; stamens 5; ovary inferior, 5-celled; styles short, not fused in to a cylindrical column. Fruit is a berry, 3 mm across, 5-angled; seeds compressed. 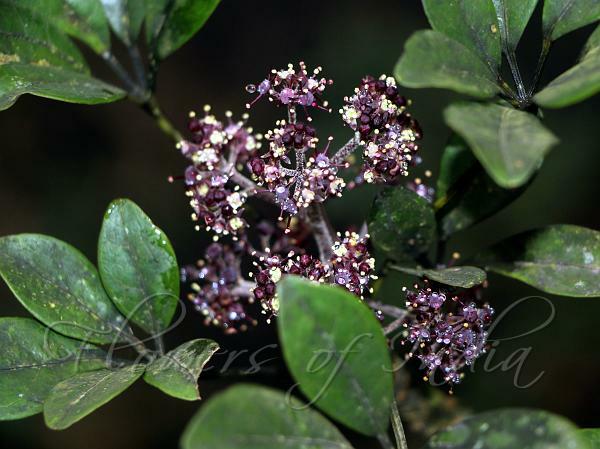 Bourdillon's Schefflera is endemic to Southern Western Ghats. Flowering: January-August.